Tagline- Hold Everything! The Cadets Are Droppinb in on Miami Beach for An All New Adventure. The Police Academy series was a highly successful franchise for Warner Brothers in the 80s and from 1984-1989 there were a total of 6 films made with a 7th in 1994 and even a TV series from 1996-1997. Franchises with seemingly never ending sequels are more common in the horror genre and in pretty much all cases the more sequels made at some point it’ll get tiresome. Really the exceptions being the Bond series, which is quite different in how each film is handled. Warner Brothers had a cash cow with the Police Academy series and basically ran it into the ground. 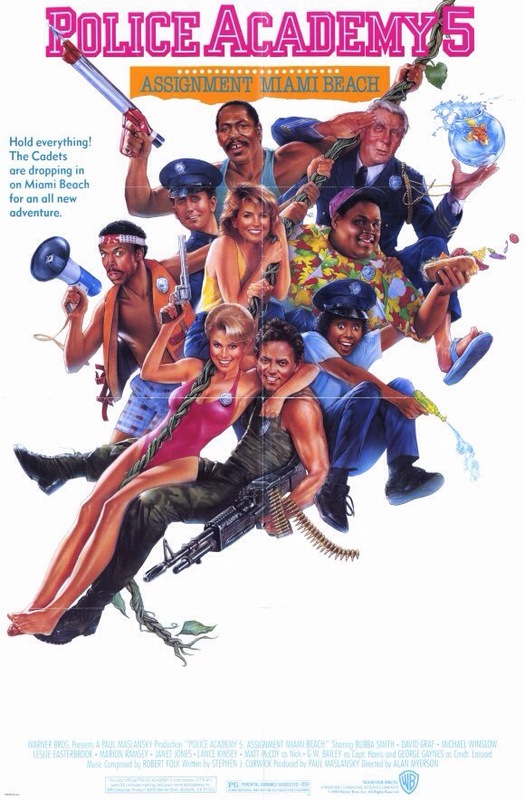 Released in 1988 Police Academy 5: Assignment Miami Beach was sort of the beginning of the end for the franchise. By this point a few of the cast members didn’t return with the most notable being Steve Guttenberg. Police Academy 5 may not be the high mark for the series, but to be honest it is one of my favorites of the series and the one I find myself revisiting most often. Each film in the series made less than the previous part and that continued here as Police Academy 5 was the lowest grossing of the series at the time (the 6th would make less and than the 7th wouldn’t even pull in a million dollars). Despite lower box office totals they pulled in enough for another sequel and all of them actually opened number 1 until the 6th film and that continued with the 7th. 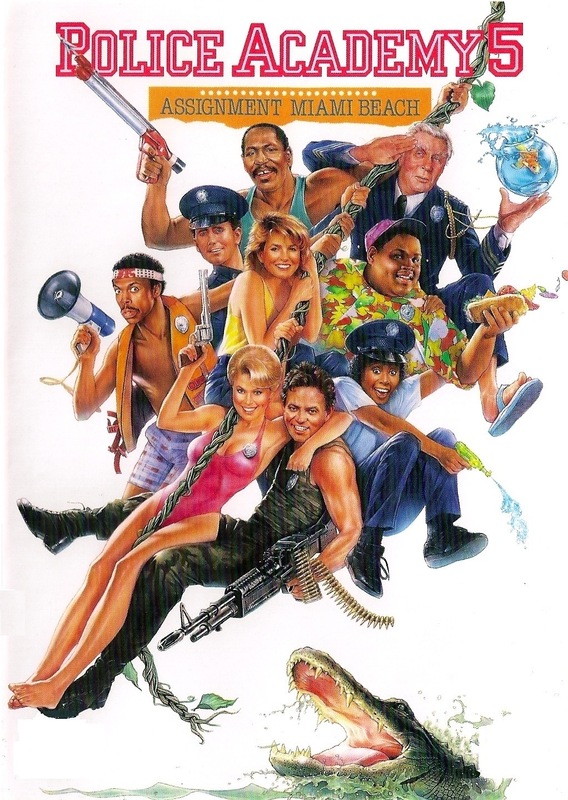 Police Academy 5 does draw mixed reviews with perhaps more subpar reviews and its easy to understand, but like I said this is one of my favorites of the series and is the very definition of mindless entertainment. The Police Academy films aren’t generally known for their plots and the 5th seems to have less. Lassard (Gaynes) is up for an award and with several members of his police academy head out to Miami Beach. However jewel thieves are also heading there and the package with the stolen jewels gets mixed up with Lassard’s stuff and the bumbling thieves set out to retrieve it. Meanwhile Lt. Harris (Bailey) learns Lassard is passed the age of retirement and plans to expose it so he can get his job. The screenplay by Stephen Curwick is light on plot, but than again most of the films in the series are, however with that said the script by Curwick isn’t meant to be high quality cinema it’s simply meant to be fun and in my opinion it succeeds. The film is absurd with some really over the top comedic scenes, but the silliness of it makes it mindless fun. Character wise, Curwick does as well as at this point all the main characters have been established and with the returning characters and new ones, Curwick mixes it in well and all the characters have at least a moment or two to shine. There are some truly hysterical moments featuring Lt. Harris and Proctor (Kinsey) and while I get the subpar reviews I thought Curwick wrote a silly, but funny script that never aims to be more than it is and always really entertaining. Director Alan Myerson crafts a well paced and fun film and at only 90-minutes it never outstays it’s welcome. In some of the sequels even the ones that clocked in at under 90-minutes can sometimes be a little overly long as the silly nature of the plots start to wear thin, but Myerson always keeps the film running smoothly and while this isn’t comedic gold and if it wasn’t a Police Academy movie would most likely be forgotten, but I found it quite hysterical. Sure the comedy is silly and immature, but Alan Myerson worked it well and of all the sequels I have no shame in saying this was my favorite. As a series goes on returning cast members can sometimes go through the motions and even new cast members don’t always seem as energetic, but I gotta give credit to the cast as they all seem to be having a lot of fun with the material and everyone gives it their all. My favorite scenes were those with Harris and Proctor as both were my favorite characters in the series and both actors have such great chemistry with each other. While the loss of Steve Guttenberg is noticeable I thought Matt McCoy did a terrific job as Nick Lassard. Basically McCoy is playing Mahoney as if not mistaken the script was written with Mahoney, but after Guttenberg passed it just had minor rewrites and some of the dialogue for Mahoney was apparently left unchanged and just changed the name of the character. Police Academy 5 is again a silly mindless film, but I really love this one. I can just sit back and enjoy the absurdness of the film and it never fails to make me laugh. As I mentioned the original to me was the best, but Police Academy 5 is the one I revisit most.